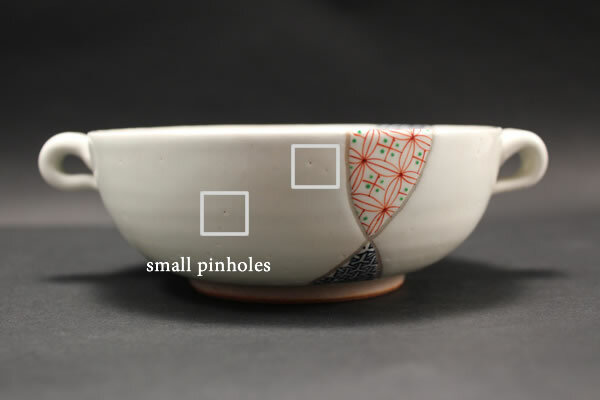 There are 2 kinds of Japanese pottery basically consists of 2 types. also called “stoneware”, made from a stone powder. It seems same, but pottery and porcelain are markedily dissimilar in a number of respects. Most notable differences are materials, hardness, color and the way to care. Porcelain is easy to care since it is very hard and impervious to water. Most daily use ceramics are porcelain. On the contrary, pottery is porous and absorbs water. So it needs to be soaked in the water before use. It needs more care, but gives you a warm feeling and the detailed sense of beauty of the Japanese. 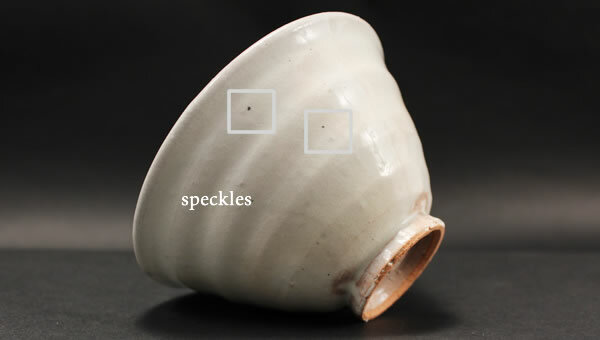 Some speckles or small pinholes are found? It is one of the decorative techniques using specific materials. by melting glaze during firing and leaves a minute pit. Or some may be caused accidentially during firing. wood ash graze. called as “Suana”(next hole) or “Yuzuhada”(citron skin). A pottery artist leave these on purpose as handworked decorations, the tasts of uniqueness. How to smooth a rough surface of the foot? You can sandpaper down. Or frictioon a foot of pottery with another.